This is a piece of cake. Actually, it’s a couple of chickens but you know what I mean. What could be simpler than sticking some chicken in a bag to marinade for a few hours? 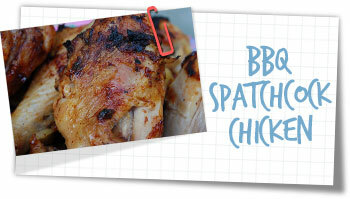 This really easy marinade works beautifully with chicken. It’s just as nice with lamb too, but I do like the taste of BBQ chicken more than any other meat. It’s a no fuss dish for summer or if you’re lucky enough to have a warm climate. If you’re in the UK and therefore standing in the back garden in your coat and wellingtons trying to keep the BBQ alight in the wind and rain- then this dish may be more hassle than you could imagine. Use a hot oven instead. To flatten the chickens, cut a bird down the length of the backbone with some kitchen shears. With the palm of your hands flatten out the bird firmly. Repeat with the other bird. Combine all the marinade ingredients together. Place the chicken into a plastic bag and pour over the marinade. Seal the bag, shake to cover everything and refrigerate for 3-4 hours. Heat a BBQ until hot. Place the bird, breast side up and grill for 15 minutes. Turn over and grill for a further 15 minutes. Be careful not to char the bird too much and be extra careful to check between the thighs and breast to make sure the chicken is properly cooked. If you’re a bit nervous about the cooking time, you can easily detach the thighs and legs at this point and cook them separately. Picture courtesy of Flickr user: MeltingMama with Creative Commons licence.